You are here: Home / Franchise / Are you looking for a business opportunity offering a six-figure potential AND broad demand? Are you looking for a business opportunity offering a six-figure potential AND broad demand? The demand for surface refinishing is incredible, and because the industry is only in its infancy, there is still so much room for growth. 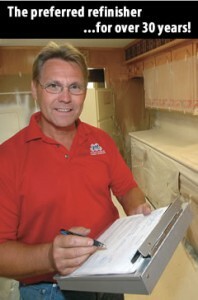 Picture this: every dwelling in the United States with a bathroom or kitchen is a prospect for refinishing. That’s a huge market! Not only do homes, apartments and hotels need bath and kitchen refinishing, but also nursing homes, college dormitories and military bases as well. The higher the demand for your services, the more potential there is for sales and profits. With Miracle Method’s franchise start-up capital ranging as low as $83,000 depending on the number of employees you hire, and with the top Miracle Method franchises generating over $1 million in sales annually, you can see that there is a very attractive opportunity to generate sales on a reasonable upfront investment. Obviously, your success will depend on your ambition and abilites, but Miracle Method can show you the way. Another advantage of owning a Miracle Method franchise is that it is recession resistant. This means that no matter the state of the economy, the fact that people can save 75 percent of the cost of replacing their bathroom fixtures and countertops by refinishing is very appealing. Our business actually gets better when money is tight because people look for ways to save money while still receiving a great value. In many respects right now is a great time for Miracle Method. In fact, we have had several record months already this year as sales continue to build for our franchise network. 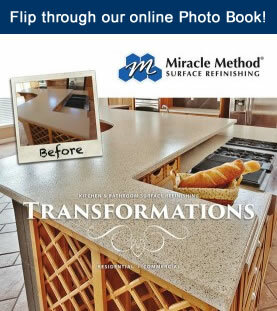 For more information on Miracle Method franchises, call 855-212-7337 or visit our website.